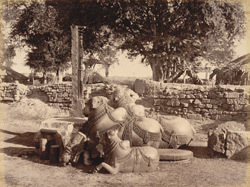 Photograph of carved Nandis in the Fort of Warangal in Andhra Pradesh, taken by Deen Dayal in the 1880s, part of the Curzon Collection: 'Views of HH the Nizam's Dominions, Hyderabad, Deccan, 1892'. Warangal was the capital of the Kakatiya rulers in the 12th-13th centuries, an important political and artistic centre in the eastern Deccan. The circular city Warangal was founded in the 12th century by the Kakatiya ruler Ganapatideva. After a number of attempts the Bahmani rulers eventually took the fort city, and in 1543 the state was absorbed by the Qutb Shahi dynasty of Golconda. The fort consists of two concentric circles of fortifications. The outer wall is an earth rampart entered through four arched gateways and the inner wall is built of granite and has four gateways in the centre of each side. The gateway in this view has a flat lintel and Hindu pilasters carrying a moulded cornice with sinuous brackets. In the centre of the city there is a ruined temple dedicated to Shiva Svayambhu and another smaller one also dedicated to Shiva which dates from 14th century. This view shows three carved and polished Nandi, the sacred bull of Shiva.